Build it using a credit card instead of a mortgage. Expand into a full cottage later. construction is in about the $15,000 to $25,000 range with a design that allows it to slip without a ripple into most types of neighborhoods. it is actually a dwelling. Although the actual living area is less than 200 square feet total it has a full bath and kitchenette on the first floor tucked in an alcove behind the single car parking section. The attic sleeping loft is accessed by pull-down stairs and has about 106 square feet of standing height room with more usable space under the sloping rafters. 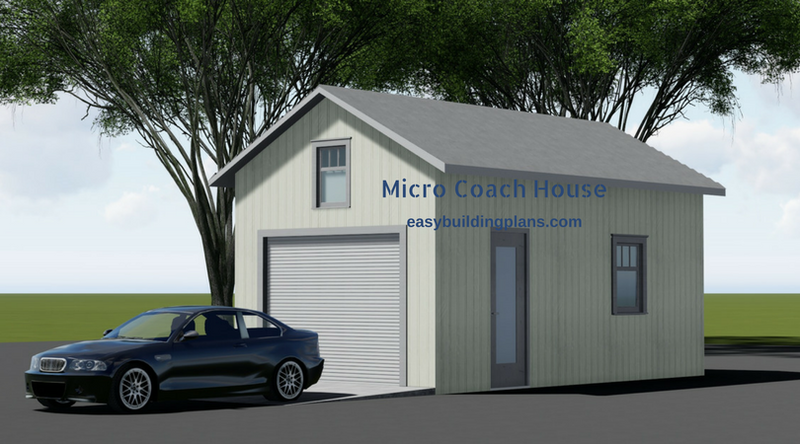 The building footprint is only 14′ x 26′ with a height of 16′ at the ridge. Complete building permit application ready plans. as expected if you think outside the box. Unless you are building on family property forget about Santa Cruz or West Los Angeles. Solutions that might work are places like Shelter Cove in the Lost Coast of Northern California, Ocean Beach on the Olympic Peninsula, in Washington,or the Antelope Valley in Los Angeles. Also there are always cheap lots on ebay, landwatch.com, or lotflip.com. with a shop and storage and used as a dwelling at a future time if needed.